Four well-known experts in their own field compete to conduct the Orchestra of the Royal Opera House. 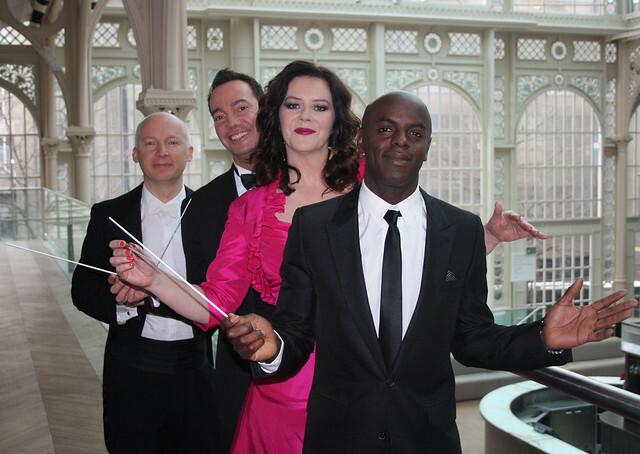 Comedian Josie Lawrence, mathematician Marcus du Sautoy, DJ Trevor Nelson and Strictly Come Dancing judge Craig Revel Horwood put their musical abilities to the test at the Royal Opera House in the second series of Maestro, which begins tonight (Friday 4 May) on BBC Two at 9pm. Over the three-part series the contestants take a crash course in conducting opera, competing to lead the Orchestra of the Royal Opera House in a live performance at Covent Garden. Each trainee conductor will be mentored through various trials and will meet with operatic experts, such as Royal Opera House Music Director Antonio Pappano, to learn about the complexities behind staging the art form. Their performance on the podium will be judged each episode by members of the orchestra. The grand finale, in which the winner will conduct a repeat of the second act of Puccini’s La bohème,to be filmed this Saturday. The first series of Maestro aired in 2008, and saw comedian Sue Perkins beat DJ Goldie to conduct the BBC Concert Orchestra at Proms in the Park. I am really looking forward to this! I loved the first Maestro series. Having nursed a fantasy to be a conductor from my teen years, I can put myself in the contestants' places soo easily. According to the email sent out on Wednesday to people who have booked for tomorrow's performance the winner will be conducting a repeat of Act 2, not the final act as stated above. This was confirmed later. What is really going to be happening? Does anybody at the ROH actually know? Apologies for any confusion. The winner will be conducting a repeat of Act 2. Thank you for your comment. The winner will be conducting a repeat of Act 2 straight after we've already heard it through once with the announced cast which we have all paid to see. Second time around (i.e. mid-performance) will be with a different cast. Contrary to what everyone understood when they bought tickets, which referred to an 'exciting event' AFTER the performance. Is that not so? We chose Act 2 as it is the shortest act and therefore would not make the evening longer than was necessary. I'm afraid it was just not possible to add the extra 30 minutes to the end of the evening, as going from Act 4 back into Act 2 would involve a major scene change. I really do apologise but would very much encourage you to join in to 'compare and contrast' or alternatively enjoy an extended interval in one of our front of house bar areas.